Similar seed pod rattle found on the public domain images. Standing in the warm Brisbane sun outside the Queensland Museum this morning, listening to Rhianna Patrick recall her story about her heritage, which reminded me of my own. My grandmother and I collected the same seeds and went through almost the same process to produce seed pod rattles for my aunts to dance with. This musical instrument is quite common in Melanesia and other cultures such as the Indigenous Australian culture. While Rhianna and her father drilled holes in the hard seed shells, grandma and I used metal rods from broken umbrellas by burning the rod on the fire until it was red, which then easily burnt a hole into the seed. 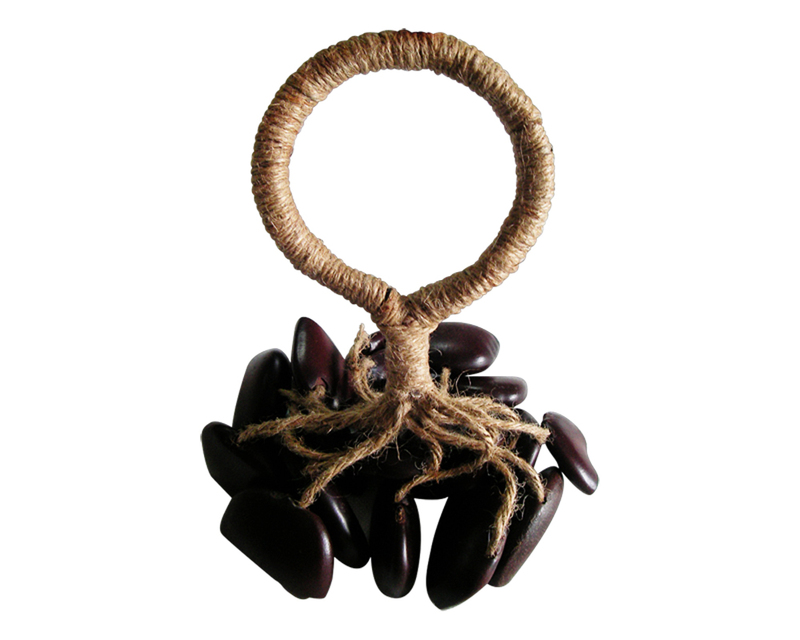 Rhianna’s story was about making the Kulap, the dance rattle (as pictured above) from the Torres Strait. The rattle was an object found in the Queensland Museum collection. Rhianna’s is one of twelve stories told in a photographic exhibition to highlight the significance of Australian indigenous cultural heritage in association with the collection. The exhibition also acknowledged young keepers of traditional knowledge and promoted the importance of skills in making these cultural objects. Young keepers of traditional knowledge and skills were encouraged to sustain the knowledge and skills for future generations. Curated by Michael Aird and Mandana Mapar, twelve outstanding indigenous Australian story-tellers were invited to speak about their personal recollections of their cultural heritage – the Kulap, an object in the Queensland Museum, was the one thing that stirred many memories for Rhianna. In her early childhood, at eight, Rhianna recalled that she had run out of things to ‘show and tell’ at school, and finally, she was forced to make something up. That was when her father suggested the two of them make the Kulap. In the process of collecting seeds on the beach to sawing the seeds in half and incising holes to threading the half seed pods together, the Kulap-making became one tradition she learnt from her father, and also one cultural heritage that has left a lasting impression on her. Rhianna’s story about the Kulap with 12 other storytellers and their personal recollections on objects of cultural significance went on show in Queensland Museum today. The event was timed to mark the beginning of the National Aborigines and Islanders Day Observance Committee (NAIDOC) week. According to Aird and Mapar, the stories told in this exhibition reflect on the tangible core themes of connection to family and country of the indigenous people. The stories also acknowledge the unique techniques used to craft some of the artefacts and signpost historical and political milestones in Queensland indigenous history. 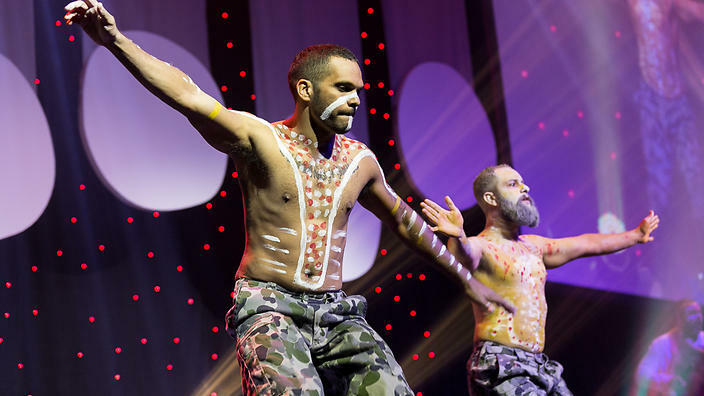 This is my heritage opened today to coincide with the Statewide launch of NAIDOC, a week-long event celebrating the history, culture and achievements of Aboriginal and Torres Strait Islander peoples. Treasurer and Minister for Aboriginal and Torres Strait Islander Partnerships Curtis Pitt said the This is my heritage exhibition was a stimulating way to recognise Queensland’s indigenous people as the primary guardians and knowledge holders of their cultural heritage. Fascinating,as always JL. The Kulap sounds like a wonderfully natural instrument. I agree that it’s so important to keep the heritage of indigenous peoples alive. Thank you very much Millie, how is your internet? Our internet is always hit and miss, Joycelin. I can be in the middle of commenting or posting and it will go off for a while. At least we have it back now. The other week we had none at all.